This quick and easy pie can be assembled in a flash and frozen unbaked. Preheat the oven to 190°C, gas mark 5. Wash the leeks thoroughly and cook in half the butter over a low heat for 5-7 minutes until completely soft. Allow to cool. Meanwhile, cut the salmon fillets into 2.5cm chunks and mix with the sauce, leeks and horseradish. Squeeze the liquid out of the spinach and add to the sauce. Season and spoon the mixture into a 2-litre gratin dish. Melt the remaining butter and use to brush over each of the filo sheets. 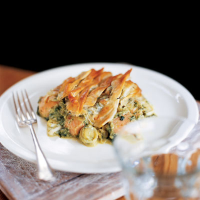 Lightly crumple the sheets of filo and arrange across the top of the salmon, taking care not to overlap them. Bake for 30-35 minutes, or until the pastry is crisp and golden, and the filling is piping hot.